Illustrating the civilizations, myths and religions that flourished in ancient Greece for more than 1,000 years, the Acropolis, site of four of the greatest masterpieces of classical Greek art – the Parthenon, the Propylaea, the Erechtheum and the Temple of Athena Nike – is the archetypal symbol of world heritage. The Parthenon, which inspired UNESCO’s logo, was badly damaged by wars and pillaging. Moreover, like all the Acropolis buildings, it risked corrosive attack, the worst being splintering of the marble due to rusting of metal beams and clamps driven into the walls as part of a 1933 restoration. Atmospheric urban pollution was another major concern. 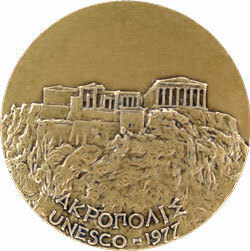 UNESCO launched an international campaign to safeguard the Acropolis in 1977, and ten years later it was inscribed on the World Heritage List. 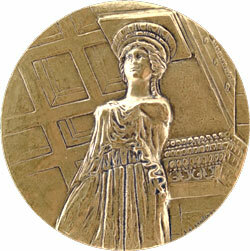 Engraved by Serge Santucci, the medal’s obverse features one of the six Caryatids, female figures supporting the ceiling of the southern loggia of the Temple of Erechtheum. The reverse has a general view of the Acropolis showing, from left to right, the complex of the Propylaea, the Temple of Athena Nike and the Parthenon. The medal was struck in 1977.